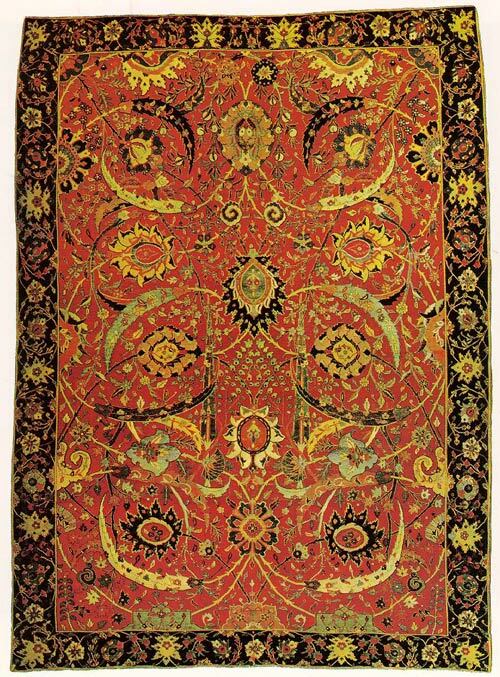 The first documented evidence on the existence of Persian carpets came from Chinese texts dating back to the Sassanid period (224 - 641 CE). 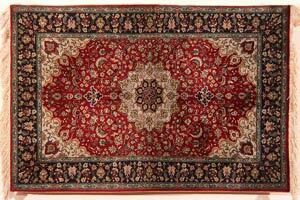 By the sixth century, Persian carpets of wool or silk were renowned in court circles throughout the region. 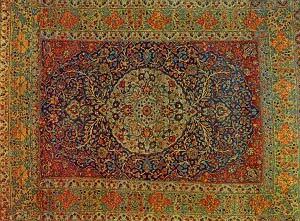 The Baharestan (spring) carpet of Khosrow I was made for the main audience hall of the Sasanians imperial Palace at Ctesiphon in Sasanian province of Khvarvaran (nowadays Iraq). It was 450 feet (140 m) long and 90 feet (27 m) wide and depicted a formal garden. 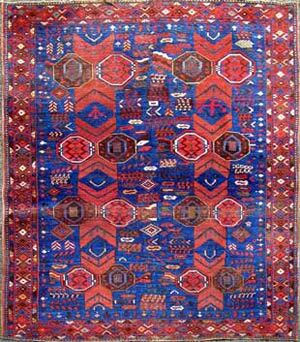 In 7th century CE With occupation of the Sasanian capital, Tuspawn, the Baharestan carpet was taken by the Arabs, cut into small fragments and divided among the victorious soldiers as booty. 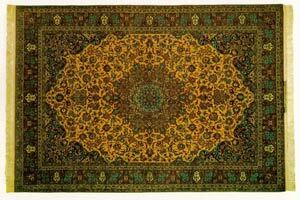 When Cyrus the Great conquered Babylon in 539 BC, he was struck by its splendour, and it was probably he who introduced the art of carpet making into Persia. 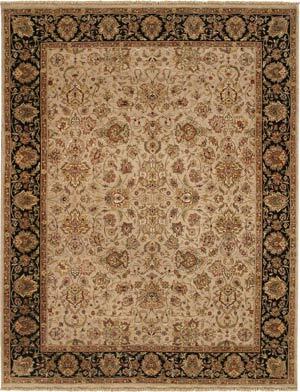 However, historical records show that magnificent carpets adorned the court of Cyrus the Great, who founded the Persian Empire over 2,500 years ago. 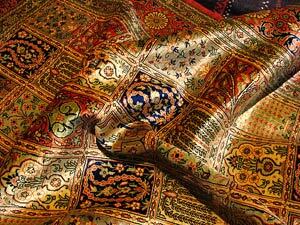 It is also said that the tomb of Cyrus, who was buried at Pasargade near Persepolis, was covered with precious carpets. 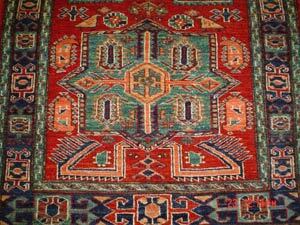 Even before his time, it is very likely that Persian nomads knew about the use of Knotted carpets. 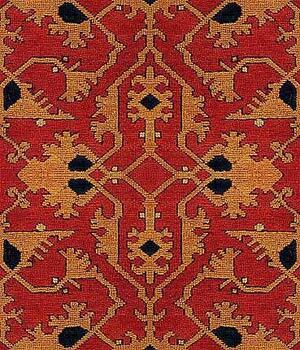 Their herds of sheep and goats provided them with high quality and durable wool for this purpose. 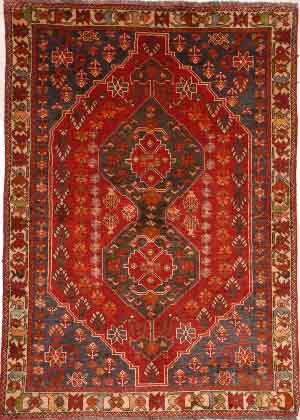 In 628 CE, the Emperor Heraclius brought back a variety of carpets from the conquest of Ctesiphon, the Sassanian capital. 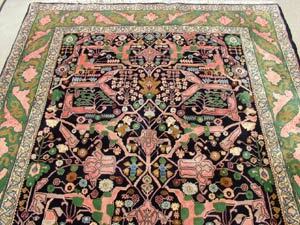 The Arabs also conquered Ctesiphon in 637 CE, and among the spoils brought back were said to be many carpets, one of which was the famous garden carpet, the "Spring time of Khosro". This carpet has passed into history as the most precious of all time. 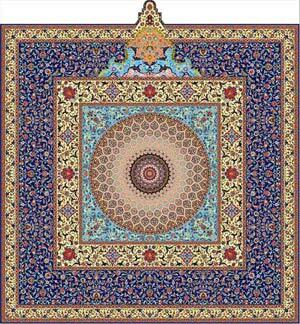 Made during the reign of Khosro I (531 - 579 CE) the carpet was 90 Feet square. The Arab historians' description is as follows: "The border was a magnificent flower bed of blue, red, white, yellow and green stones; in the background the color of the earth was imitated with gold; clear stones like crystals gave the illusion of water; the plants were in silk and the fruits were formed by color stones". 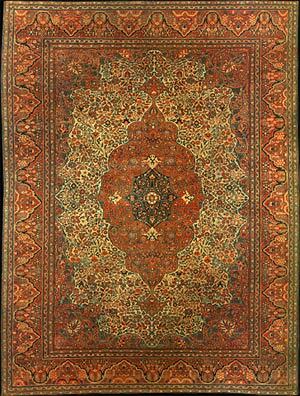 However, the Arabs cut this magnificent carpet into many pieces, which were then sold separately. 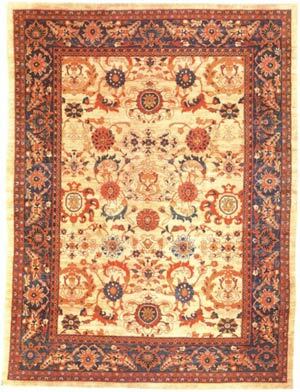 Although carpet production is now mostly mechanized, traditional hand woven carpets are still widely found all around the world, and usually have higher prices than their machine woven counterparts due to them being an artistic presentation. 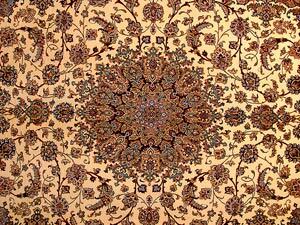 Iran exported $517 million worth of hand woven carpets in 2002. 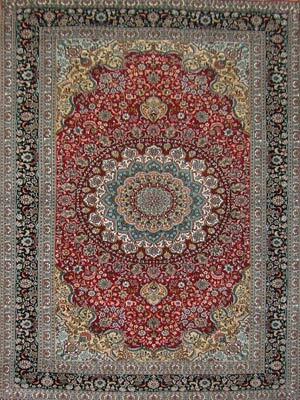 There are an estimated population of 1.2 million weavers in Iran producing carpets for local markets as well as export. 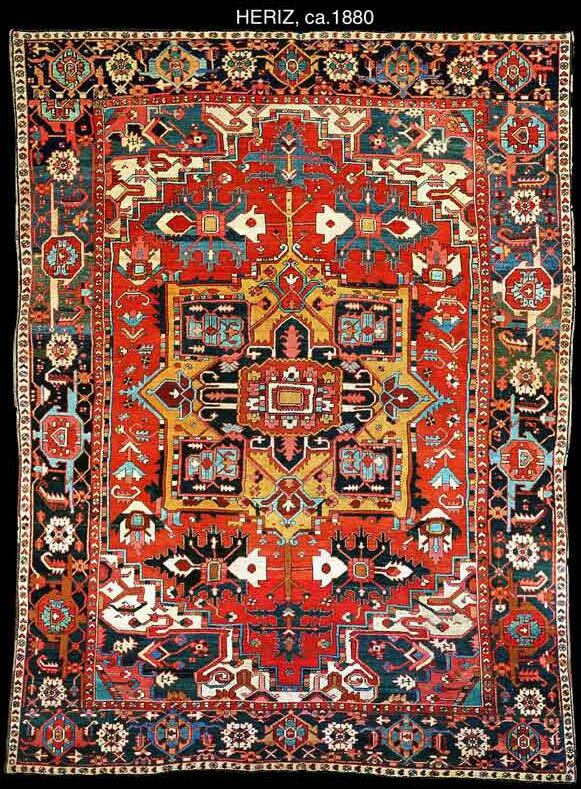 In recent times Iranian carpets have come under fierce competition from other countries producing fakes of the original Iranian designs as well as genuine cheaper substitutes. Most of the problems facing this traditional art is due to absence of patenting and branding the products as well as reduced quality of raw materials in the local market and the consistent loss of original design patterns. The absence of modern R&D is causing rapid decline in the size as well as market value of this art. About Iran Review: Iran Review (www.iranreview.org) is the leading independent, non-governmental and non-partisan website - organization representing scientific and professional approaches towards Iran's political, economic, social, religious, and cultural affairs, its foreign policy, and regional and international issues within the framework of analysis and articles.